Business owners will be provided with extra support under a new Small Business and Family Enterprise Ombudsman if the Coalition comes into power at the next election, Opposition leader Tony Abbott announced today. Addressing the National Small Business Summit (NSBS) in Brisbane, Abbott says in addition to a minister for small business in the cabinet, Bruce Bilson, the Coalition will provide an extra focus on small business. "I announce today that an incoming Coalition government will create a new statutory office of the Small Business and Family Enterprise Ombudsman," he says. According to Abbott, small businesses are too often wedged between rules for individuals and rules for businesses. "Small businesses have got to deal with all of those rules, and yet few of them can afford the expensive support services, the accountants and lawyers that are necessary to navigate your way through the thicket and the tangle of rules," he says. The Ombudsman will act as a policy activist within government, empowered to work across all areas to ensure small business and family enterprise concerns are "embraced and understood". "The new Ombudsman will support a single access point for current small business programs such as those funded by the industry portfolio," Abbott explains. "The Ombudsman will be an advocate and will also be able to help small business people to resolve disputes with government agencies," he says. Just as there is the Fair Work Ombudsman to promote harmonious workplaces, Abbott says the Small Business and Family Enterprises Ombudsman will promote small business in the halls of government. "Secondly, we are going to give a fair go to small businesses that sign unfair standard form contracts. An elected Coalition government will include small business as consumers for the purposes of the unfair contracts law already approved by the parliament," he adds. 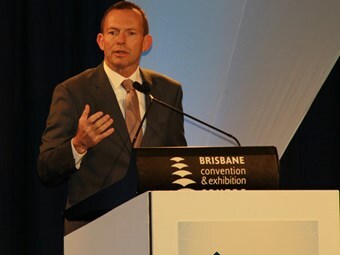 Abbott was the keynote speaker at the COSBOA NSBS held at Brisbane’s Convention and Exhibition Centre today. Other speakers included Minister for Small Business Craig Emerson, Australian Taxation Office Commissioner Michael D’Ascenzo and Fair Work Ombudsman Executive Director Michael Campbell. Deputy Prime Minster Wayne Swan will be speaking at the NSBA gala dinner later tonight.